Pennsylvania Dutch farm in miniature! I have recently completed a small vignette for my wargaming table, as well as to use to attract attention to my table when I am selling and signing my Civil War books I have written. This scene shows a Pennsylvania German farmer, let’s call him Jacob, nervously guarding his barn as he spots a distant dust cloud which indicates the arrival of Confederate foraging parties in his neighborhood. “Here come the Rebels!” has been the cry for weeks, and they have not come. Jacob has failed to take his horses to safety (they are in the stable in back of the barn). He will attempt to negotiate with the raiders. He has a yellow membership card to the Knights of the Golden Circle, knows their secret password and identifying hand signals. For this information he has paid $1 to a couple of men from New York City who have visited his farm. They sold him the ticket and secret signs and told him the Rebels would leave his personal property, livestock, and horses alone if he showed them he was a member of the Southern-sympathizing K.G.C. Click on the photos for better views of old Jacob and his farmstead. Back issues of CHARGE! newsletter now on-line for only $2.99 each! 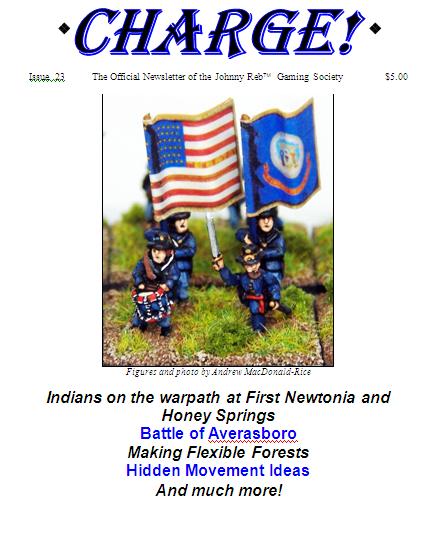 YORK, PA — The Johnny Reb Gaming Society, a non-profit wargaming society based in York, is pleased to announce a partnership with the Wargame Vault to offer back issues of CHARGE!, our official quarterly newsletter. Each issue features 2-5 regimental-level scenarios to recreate battles of the American Civil War using miniature wargaming rules systems such as Johnny Reb 3, Regimental Fire & Fury, Civil War Commander, Rally Round the Flag, Gettysburg Soldiers, and many others. Back issues #1 – #24 are now available on on-line at the Wargame Vault for only $2.99 per issue. All are downloadable and printable. For an index of these scenarios and ordering information, please visit the website of the Wargame Vault. John Zabawa is the proprietor of one of the coolest stores in all of Gettysburg, Pennsylvania. Among the tourist traps, trinket shops, and souvenir stands, John’s store stands out as a MUST SEE for any wargamers, diorama enthusiasts, miniaturists, or Civil War toy soldier buffs. With plans to expand in the future, his store will get even better and better as the years progress! Gettysburg Group Reservations recently vacated a part of the building adjacent to John’s toy soldier shop, offering potential for possible future expansion for Gettysburg Miniature Soldiers, which is located on the popular Steinwehr Avenue strip, at the intersection with Taneytown Road. This site in 1863 figured in the Battle of Gettysburg. Let’s take a virtual tour of Gettysburg Miniature Soldiers – a mini-paradise for gamers and figure collectors!!! I am fortunate to live in York County, Pennsylvania, an area replete with scores of 19th century flour mills, many of which were prominent during the Civil War. For example, the above grist mill along the banks of the Codorus Creek in Spring Garden Township was owned in 1863 by Josiah E. Myers. Typical of millers of the era, he grew or purchased oats, rye, corn, and or wheat to make flour and other products for commercial sale. He also did consignment work for other farmers. In other words, area farmers could bring in a few bushels of their own grain, and Myers would mill it for them for free, with his compensation being a percentage of the ground flour. My old college friend George Nafziger (a wargaming host when we were students at Miami of Ohio) had on display in his booth at the Fall In dealer hall a new 10mm building that is sure to get a lot of interest from ACW gamers! It a very nice depiction of the standard German-style overhanging bank barn, which are so very common here in south-central Pennsylvania. This new resin model is detailed, well sculpted, and paints up quite well. It has the barn and a base plate. The model could easily be used for the McPherson, Bliss, or Rose barns at Gettysburg, all of which were in this general style. Although quite pricey ($22), this may be the most accurate Pennsylvania Overhanging Barn model I have yet seen. It’s sure to be a conversation piece on your tabletop Gettysburg layout and, coupled with what John Mayer’s Round Top Miniatures is now producing, there is a very refreshing renewal of interest in 10mm Gettysburg buildings. Les Batiments can be reached at their website or by mail at P.O. Box 8122, West Chester, Ohio 45069-8122. Very nice addition George! Keep the Gettysburg buildings coming! What buildings would you like to see the manufacturers add to their existing product lines? New Gettysburg buildings added to Round Top Miniatures’ 10mm line! John Mayer of Round Top Miniatures in Gettysburg has begun to expand his new line of 10mm Civil War buildings, which was first introduced earlier this year with a casting of the Snyder house ($11 U.S.). New buildings, most modeled after historic structures on the Gettysburg battlefield, include the Abraham Bryan (Brien) house ($11) and barn ($12) and the Widow Mary Leister barn ($14). Non-Gettysburg castings include a stone bridge ($18), sharpshooters’ pit ($15), and a one-story generic stone house ($10). Round Top Miniatures sells these miniatures at selected retail outlets in Gettysburg, as well as to gamers around the world via the Internet. Check out John’s website at www.roundtopminiatures.com. New line of 10mm Gettysburg historical buildings! John Mayer of Round Top Miniatures in Gettysburg is in the early stages of launching a new line of 10mm resin castings of several different buildings and houses associated with the Battle of Gettysburg. John is a very talented scratch-built modeller who has primarily focused in the past on 28mm scale wooden buildings for his own impressive Brother Against Brother games (photos of these will grace the new BAB scenario book Ivor Janci and I are currently collaborating on). John has decided to begin production of resin castings of his smaller scale buildings. 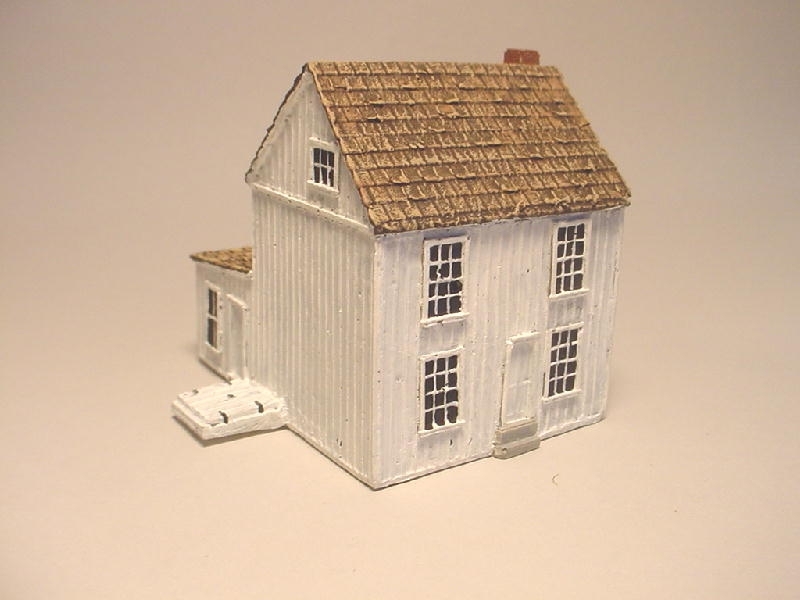 I received a prototype sample of his new 10mm model of the Snyder farmhouse. The original house sits on the battlefield just west of Emmitsburg Road (the small white frame house near the intersection with West Confederate Avenue) and is on ground used by the Confederates under Longstreet for the Day 2 attack. The detail on the model is excellent; the casting is clean and ready for priming and painting with very little flash or extraneous material. It comes with a separate outhouse. John will, over time, produce a line of N scale or 10mm buildings that covers a variety of recognizable Gettysburg structures. He will primarily focus on buildings not previously covered by other 10mm manufacturers, but expects to have some repetition with current products for a few more popular buildings. John plans to sell both unpainted castings and custom-painted models for those gamers who prefer ready-to-play finished houses. Round Top Miniatures expects to sell these models at selected retail outlets in Gettysburg, as well as to gamers around the world via the Internet. A website is under construction – www.roundtopminiatures.com.